Well after prolonging it for months I have finally finished Storm of Iron. Nothing against the book, its awesome, but other stuff kept coming and I kept putting it off. Having finished Hunt for Voldorius I decided to finish Storm of Iron as well. The novel begins on Hydra Cordatus, a backwater fortress world manned by the 383rd Jouran Dragoons Regiment. A thankless duty quickly turns into a fight for survival when the Iron Warriors, led by the enigmatic Warsmith, assail the planet with their siege warfare. The Warsmith’s three captains, the blood-crazed Kroeger, the methodical and apathetic Forrix, and the young and eager Honsou, are tasked to bring down the Sepulchre and kill its defenders to a man, and to recover a secret objective that The Warsmith will not discuss, but demands be recovered intact. The novel focuses on two viewpoints. Honsou and the Iron Warriors primarily but also shows the defenders from several viewpoints including errant Guardsmen Hawke who aids the defenders from behind enemy lines, Colonel Leonid who’s leadership is tested to the breaking point and Major Tedeski who holds the Tor Christo bastion. The Iron Warriors continue their siege tactics but with Hawke’s aid the defenders are able to bring down the entirety of the enemy’s Daemon-Engines and severely damage their Titan Legio, Legio Mortis which contains the infamous Dies Irae, responsible for bringing down the walls at the Emperor’s Palace. With the arrival of the Imperial Fists third company under Captain Eshara things look to be turning around, but the chances of victory are not guaranteed, and what secrets does the Sepulchre holds that The Warsmith demands victory so much, and that the Mechanicus would guard so fervently. While it took me a long time to read Storm of Iron it was in no way the books own fault, it was mine. Other novels kept arriving and I put them first before Storm of Iron, but now that ive finally finished it I wish I had done so much earlier, because its a great book. Well-paced and containing an excellent depiction of the grinding engine that is siege warfare, trenches, artillery emplacements and storming actions are all found within and more with epic Titan duels and Space Marines massacring each other. 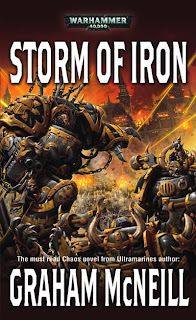 High Point: I thought that the two high points of this novel were the depictions of siege warfare, no other 40k novel has done this as well and its easy to get bogged down in semantics and grinding attrition but Graham McNeill does it expertly and delivers a fantastic experience of the Iron Warriors methods of war, rather then the lightning assaults favoured by all other marines, and the Iron Warriors method is no less deadly. The second high point was the death of Captain Forrix. After he and a squad of Terminators assault a Warhound Titan they are able to bring it down through utilizing the open-spaces and getting close enough that it cannot unleash its guns upon them. After it topples and Forrix sprays the crew with his Storm Bolter, only for another Warhound to smash the wall down and stare Forrix down for a moment, before utterly annihilating him with all of its guns. He felt only a moment of pain and frustration before he perished. Low Point: I felt that the Mechanicus betrayal early on in the novel was not received very accurately. What they did was treachery and grounds for immediate execution, regardless of position or affiliation, but the Guard officers act like they have to appease them and keep them sweet. And Magos Naicin, despite being a warp-touched mutant was not detected at any point in the novel, even when in the same room as an Imperial Fist Librarian. A bit odd. 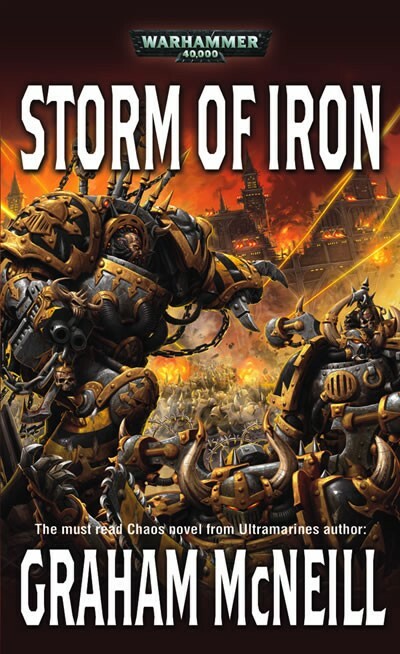 I give Storm of Iron a well-deserved 8.5/10 for its depictions of siege and trench warfare, an interesting insight into the Iron Warriors and showing how Honsou became the Warsmith we all know and love. Its a shame that Kroeger and Forrix didn’t make it, but at least the Warsmith got what he wanted, eternity. I was quite surprised at your rating of this novel. You often rate novels pretty high. This novel may be the only novel that really shows the excellence of the Iron Warriors and you rated it pretty low. Your low point seems a bit harsh as well. Magos from Mars have always acted in their self interests. I don’t think its hard to believe they would follow chaos, over a half of them did in the novel Mechanicum. Also, I think its a bit odd that you think an Imperial Fist would be able to detect that as though putting liberians on planets can root out the heretics.